Ever since we planted our milkweed patch to foster the local monarch population, other butterflies seem to be hanging out in greater numbers too. We don't know if it's because the presence of monarchs signals a safe haven for butterflies--or they just like to party--but we've definitely seen more swallowtails, skippers, and cabbage flies around. Now, with the blooming of our cassia tree out back, we've had an influx of bright-yellow sulphurs. Despite efforts to prop it up, our cassia tree has been leaning more each year and it's clear it will fall over soon. We look forward to its bright yellow flowering every fall so we've kept it. We also hoped we'd attract more Cloudless Sulphur butterflies, since cassia is their host plant. Sure enough, we've had lots of pairs fluttering around this week as the tree bloomed, and today I was able to photograph a female laying her eggs. 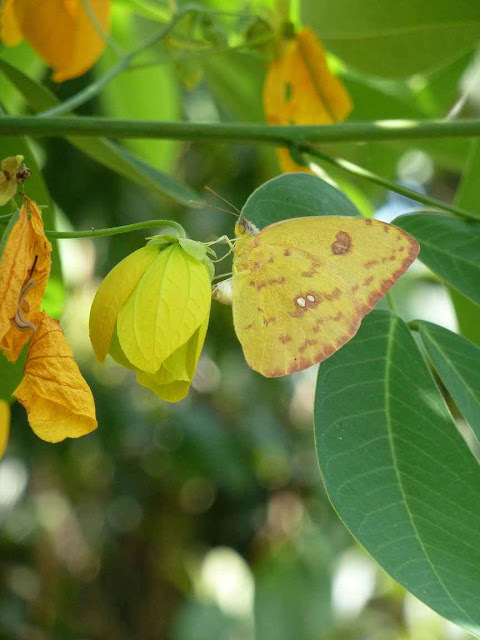 As you can see, the sulphurs have developed camouflage to blend in perfectly with cassia flowers. Neat, huh? When they flutter around, they look like little flying autumn leaves. 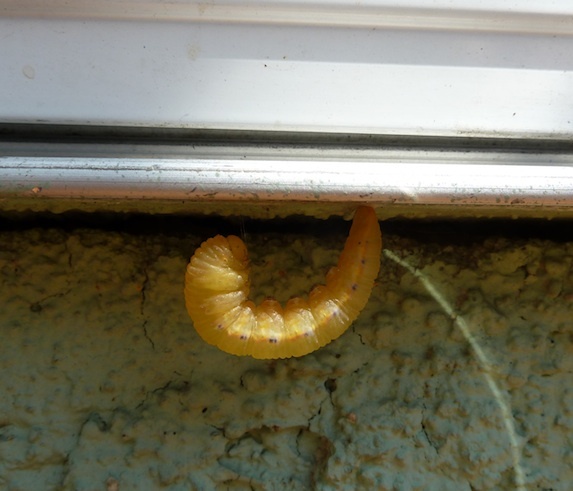 Though it mystified us at first, this turns out to be a sulphur caterpillar! Did this guy think yellow butterflies needed equal time? Anyway, looks like he'll be hanging around for a little while, ahem, and we're happy to oblige with a little social-media mention. 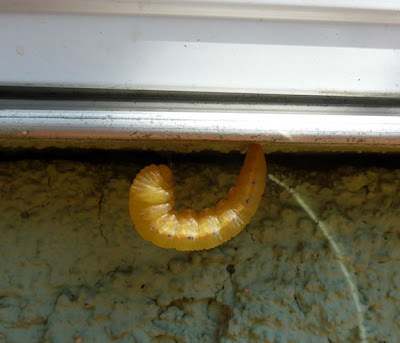 We have no idea what the chrysalis will look like or how long it will take to emerge, so this will be a learning experience for us here at Archie's Garden....stay tuned! P.S. : Would anyone like to suggest a name?